Securities and Advisory Services offered through LPL Financial, a Registered Investment Advisor. Member FINRA/SIPC. 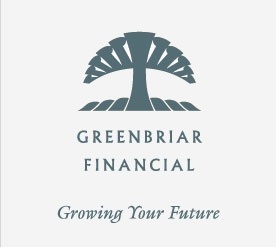 Financial Planning offered through Greenbriar Financial and Greenbriar Financial Services are separate entities from LPL Financial. Securities related services may not be provided to individuals residing in any state not listed below. Alabama, Arizona, California, Colorado, Delaware, District of Columbia, Florida, Georgia, Iowa, Kentucky, Louisiana, Massachusetts, Michigan, New Jersey, New Mexico, Ohio, Oklahoma, Oregon, Pennsylvania, Texas, Virginia, Washington.